Please Note: Kerry Library staff will be glad to offer﻿ advice on queries concerning Kerry local studies. However, staff are not available to undertake research on behalf of members of the public. 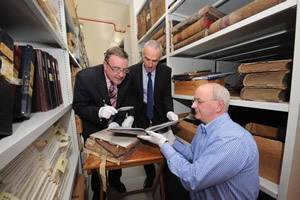 The Kerry Local History & Archives section, based at Kerry Library Headquarters, Tralee holds many and varied holdings. They include a coverage of local government from the Poor Law era onward, as well as a good selection of donated and salvaged material. The following list is a snapshot of what is available. Many of the collections have not yet been fully catalogued, but can be fairly easily consulted. Kerry Library is now in a position to receive and preserve archive collections from around the county. If members of the public are aware of business or family collections, which may be under threat for one reason or another, the library can assure them of an environmentally safe home where they can be properly catalogued and their research value fully realised .